The Arc-Zone Pro II TIG Semi-Automatic Cold Wire Feeder improves productivity by eliminating stops caused by cut length wire. You can now reduce the cost of filler metal by utilizing spooled wire instead of cut length. The system is designed with high frequency protection to ensure reliability in all TIG applications. The Arc-Zone Pro II TIG includes a feed pen and 8' (2.4m)lead, drive rolls, power cord and plug for 110V input power. 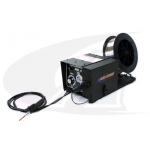 Additional drive rolls and wire sizes are available.